Trump regime hardliners are waging war on Venezuela by other means. Their tactics include a combination of media supported propaganda, cyber and other attacks on the country's electricity grid and other infrastructure, along with using armed mercenaries to stoke violence and create chaos. To combat Trump regime tactics, Maduro ordered Venezuela's military to be on high alert against US "unconventional" warfare, including attacks on public services - admitting sabotage of the nation's electricity grid remains "serious." According to Syria's Assad, "(w)hat's happening in Venezuela is similar to the developments in" his country during early days of US aggression. The Obama regime orchestrated anti-government demonstrations, masquerading as a popular uprising, followed by proxy war, using ISIS and other jihadists, later supported by US troops on the ground and Pentagon terror-bombing, endless war in its 9th year with no prospect for resolution because US hardliners reject it. Together with Syrian Foreign Minster Jorge Arreaza in Damascus, Assad slammed "flagrant (US) interference" in Venezuela, similar tactics used against "anyone who does not adhere to their policy," he stressed. Sergey Lavrov is more hopeful, saying what's going on in Venezuela won't escalate into "a second Syria." Bipartisan US hardliners have lots of dirty tricks to employ, including cyberwar, other sabotage, and proxies stoking violence. Maduro accused the Trump regime of using Venezuela as "a testing ground for new cybernetic, electromagnetic war weapons and a new war strategy, which is not a direct invasion or bombing by missiles, but the bombing of vital public services." "I know about the criminal plans of those leading the opposition, about their plots for my murder," adding he "raise(d) alarm in the military units of the country to elevate "intelligence and counterintelligence activities" to the highest level. "I have ordered the formation of 50,000 Popular Defense Units in all the neighborhoods and cities, in every corner of the country to support and strengthen the integral defense of the homeland." Separately, Venezuelan Deputy Foreign Minister Ivan Gil said "if a threat arises, such as infiltration by hostile elements in order to attack the people, then we will be ready to fight back." It's hard to believe Lavrov said the following, stressing "(w)e don't accept the methods with which the US is trying to improve the life of the Venezuelan people (sic)." Republicans and undemocratic Dems are disdainful of ordinary people worldwide, at home and abroad. Trump regime strategy in Venezuela involves inflicting maximum pain and suffering on the Venezuelan people, hoping they're turn against Maduro. It's similar to tactics used in all its war theaters, in Iran, and against all countries unwilling to subordinate their sovereignty to US interests. US ruling authorities don't give a damn about ordinary people everywhere. In Venezuela, their policies are designed to harm them. In the US, ordinary Americans are exploited, not equitably served. Inner cities are virtual battlegrounds. Social justice is fast eroding en route to disappearing altogether. US policies aim to ill-serve and abuse ordinary people everywhere. Lavrov saw the devastating effects of US-orchestrated shock therapy on Russia in the 1990s firsthand. It created shocking levels of poverty, inequality and human misery, what the Trump regime has in mind for Venezuela and all other countries it aims to control. In America, countless tens of millions are impoverished, ill-fed, ill-housed, ill-served - suffering under the yoke of exploitive rule. As part of restructuring his government, Maduro replaced Electricity Minister Luis Motta Dominguez with Igor Gavidia, a former state-run electrical Corpoelec company official with vitally needed expertise. According to Venezuelan Vice President for Planning Ricardo Menendez on Wednesday, the Bolivarian Republic may conclude an agreement with Russia relating to Venezuela's power sector. In Moscow through Thursday, he said the topic of Venezuelan electricity is being discussed in the wake of US sabotage attacks on the nation's power grid. "(I)n this regard, we…intend to cooperate with Russia…This is the agenda and we will work during the meeting to see what we can conclude," he explained. 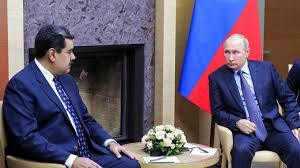 Further involvement of Moscow in Venezuela's oil, finance and agriculture sectors is also being discussed. Mutual cooperation between both countries in vital sectors of Venezuela's economy is crucial to defeat the Trump regime's coup plot.